In this climate of near constant streams of media messages, organizations need to know how to effectively communicate risks to their audiences and what to say when a crisis strikes. 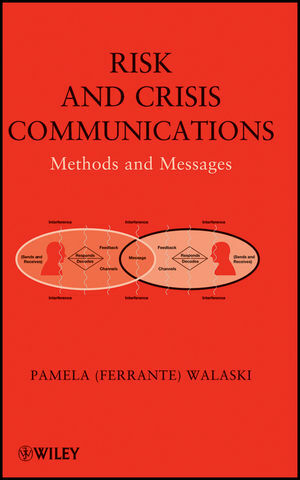 Risk and Crisis Communications: Methods and Messages is designed to help organizations understand the essential components of communicating about risks during a crisis, and it carves out a role for safety health and environmental (SH&E) professionals in the process. Covering common theoretical concepts and explaining the positions of noted experts in the field such as Peter Sandman and Vincent Covello, the book provides a fundamental understanding of the process behind crafting effective messages for a variety of different situations and explains the consequences of saying the wrong thing to an emotional audience. Incorporating numerous case studiesincluding the BP Deepwater Horizon Oil Spill and the 2010 H1N1 pandemicit shows how messages can change the way an audience perceives an event and how they react to it, clearly demonstrating how ineffective messages can create untold difficulties for an organization's public image. Savvy SH&E professionals know that their role in helping to craft risk and crisis messages as well as assisting in the execution of risk communication plans provides a critical path to becoming more valuable members of their organizations. Risk and Crisis Communications: Methods and Messages provides invaluable assistance in helping SH&E professionals add value to their organization. Pamela (Ferrante) Walaski is the President of JC Safety & Environmental, Inc., a health and safety consulting firm and is a frequent speaker and seminar presenter on the topic of risk and crisis communications. She holds both the CSP and CHMM designations, and writes regularly for the leading professional journals. She is both chair of the Technical Publications Advisory Committee and administrator of the Consultants Practice Specialty of the ASSE, and was a contributing author to The Safety Professionals Handbook. In 2011, she was the recipient of the ASSE President's Award.